You need an espresso old fashioned... now. A collaboration between a huge corporation and one of Seattle’s hippest small businesses? I have to admit I was more than a little skeptical when I first heard about The Lounge, a new Capitol Hill venture between AT&T and Ada’s Technical Books and Café. Ada’s co-owner Danielle Hulton said she was suspicious at first, too—the result, however, is a beautiful neighborhood spot that’s equal parts AT&T retail shop, Ada’s coffee shop and venue for community-driven workshops, events, musical performances and more. 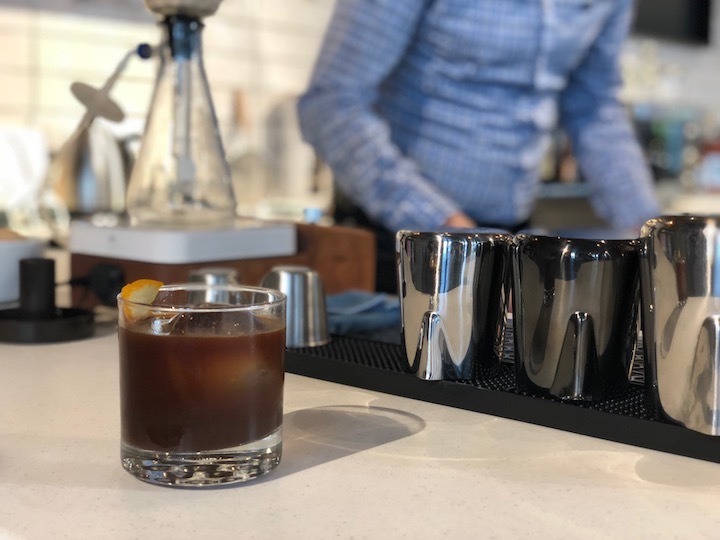 Hulton, who owns Ada’s with her husband David (a technical whiz who designed the coffee-making robots you’ll see here), says over the last eight years they’ve toyed with the idea of opening a second location. When AT&T came calling with this idea, she didn’t know what to make of it. But she says they’ve been able to retain autonomy over the café portion—you’ll be able to get espresso drinks worthy of the choosiest coffee nerd, plus baked goods made in the original Ada’s location—and have also advised AT&T execs on the sort of vibe Capitol Hill residents go for. The AT&T portion of the spot offers digital retail in the form of giant touch-screen TVs, which… we’ll see how that works out. Capitol Hill loves a coffee shop, but do they love a corporate tech retail space? AT&T senior vice president of the west region Jeff Bradley says they want The Lounge to be a second living room for the neighborhood, whether folks are AT&T customers or not. It’ll definitely be a great space to hang out, drink coffee and work remotely. But will they actually sell any non-edible products? We’ll have to wait and see. The Lounge opens officially next Wednesday, Sept. 26 at 800 E Thomas St.